A bad injury to Eoin Bradley marred Coleraine’s 4-2 win at home to Portadown. The front man collided with the post wiyth only two minutes gone and received treatment on the pitch for nearly 20 minutes before being taken to hospital. Unconfirmed reports suggested Bradley suffered ribs damage following the collision. 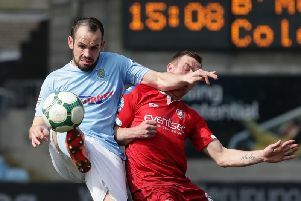 The game burst into like inside the first minute as Adam Foley crashed in an unstoppable from outside the box after the hosts failed to properly clear Brendan Shannon’s corner. The Bannsiders nearly equalised within a minute as Ian Parkhill teed up Bradley. He failed to hit the target, but in his follow through he collided with the post. Their was much concern for the forward as paramedics treated him on the pitch for nearly 20 minutes. An ambulance was called and he was taken to hospital after receiving a standing ovation from the watching crowd. Within a minute of the restart Coleraine drew themselves level as Ian Parkhill fed the ball through for Brad Lyons, he showed great composure to slot past Chris McGaughey. And the young midfielder doubled his tally on 31 minutes as he powered in a header from Neil McCafferty’s corner. The lead only lasted seven minutes though as Adam Foley’s snapshot was palmed out by Chris Johns, but Alan Byrne was on hand to fire the rebound into the roof of the net. The second half took a while to get going, but cometh the hour cometh the man as Neil McCafferty curled in a delightful free kick from 20 yards after Lyons had been upended by Shannon. The keeper did well to push away Lyons low shot on 69 minutes, with Jordan Allan being crowded out on the follow up. Coleraine wrapped up the win in the 88th minute as Darren Mccauley headed in Parkhill’s cross. Coleraine: Johns, Kane, Mullan, Harkin, Douglas, Ogilby, McCauley, Lyons, Parkhill, Bradley (McCafferty 21), Allan. Subs: Twigg, Kee, McConaghie, Doherty. Portadown: McGaughey, Carson, O’Hara (Gardner 45+1), Lyttle, Byrne, Shannon, McGerrigan, Foley, Haire (Soares 66), Mulvenna (McAllister 76), Parker.